The new Director General, National Agency for Food and Drug Administration and Control (NAFDAC), Professor Mojisola Christianah Adeyeye has officially resumed duties with a commitment to lead the Agency toward eliminating substandard foods and drugs in the country. Professor Adeyeye who disclosed this in Abuja at the Agency’s corporate headquarters while addressing staff on her resumption of duty, said although NAFDAC has over the years, made steady progress in protecting the health of the nation, the Agency under her administration will continue to ensure the health of all Nigerians and foreigners residing in Nigeria are not jeopardized by the use of substandard or counterfeit regulated products. She expressed deep concern that while majority of Nigerians have concerns over safety of drugs, food, medical devices and water, little do they know that chemicals can also kill people easily, which is why she has come to ensure that NAFDAC lives up to her responsibility of eliminating falsified and unsafe drugs, medical devices, foods and water in Nigeria. “The concerns of our people are mainly about safety of our drugs, food, medical devices and water. Most people, including those who manufacture fake drugs and sell bad foods or water, do not plan to kill people, but may not fully understand that chemicals (be they in drugs or food, or through bio-contamination) can kill hundreds of people easily”. 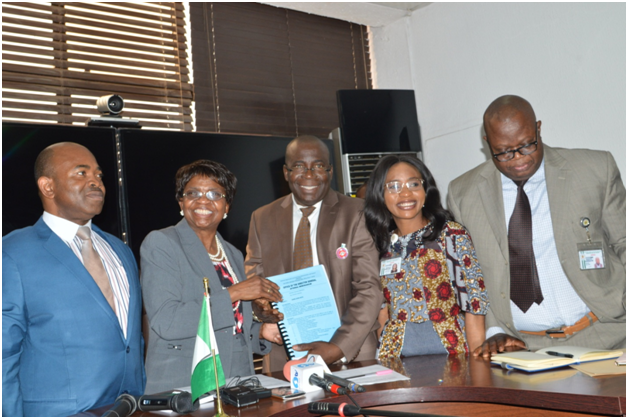 The NAFDAC DG expressed appreciation to the United States Pharmacopeia (USP); United States Agency for International Development (USAID); World Health Organisation (WHO); Nigeria Academic Pharmacists as well as other partners for their efforts and support of NAFDAC in the assurance of quality food, medicines and medical devices for all Nigerians. She equally thanked the National assembly for their efforts so far towards passing the Fake and Counterfeit Drug Act, saying the attainment of the mission and vision of NAFDAC is a collective responsibility of all and her role as a Director General is to provide the needed leadership, direction and motivation to all staff for the realization of the goals of the Agency. L-R: Dr. Abubakar Jimoh, Director Special Duties NAFDAC, Prof. Mojisola Christianah Adeyeye, Director-General, NAFDAC, Mr. Ademola Mogbojuri, the immediate past Ag. DG, NAFDAC, Dr Monica Eimunjeze, Director Drug Evaluation and Research and Prof. Samson Adebayo, Director Planning, Research and Statistics during the hand-over ceremony in Abuja. Earlier addressing Management staff during a brief handover, Professor Adeyeye acknowledged that though NAFDAC will be taking a new path, with all hands on deck, they can achieve greater success. “We are all going there together because of our children, our husbands, our wives and indeed every Nigerian. We are in charge of food, drug and water. That is to say anything that goes into our body, we are in charge of it and that is how serious I take drugs, food and water and we will go there together”. 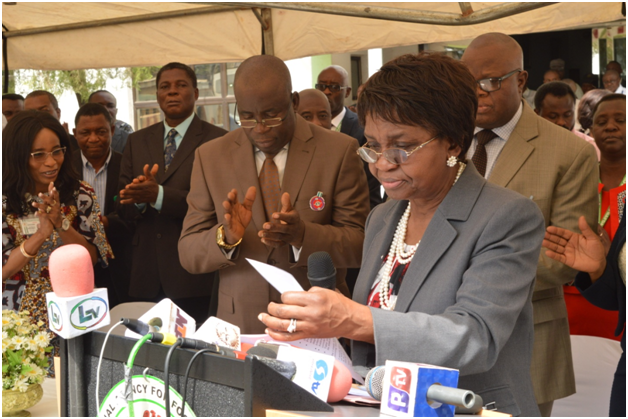 She maintained that there is so much responsibility for NAFDAC as an Agency of government in terms of preventing adulterated and substandard drugs, food and water which can cause death and she is determined to ensure the workforce is strong and highly motivated to achieve the Agency’s mandate. In his remark, immediate past Acting Director General of NAFDAC, Mr. Ademola Mogbojuri expressed delight that the Agency has yet another professor per excellence to take over the baton of leadership in NAFDAC, saying it is a new dawn all hands must be on deck to take the Agency to a lofty height where it can remain a reference point in the comity of regulatory agencies in the country.